IBEC’s Biomedical Signal Processing and Interpretation (BIOSPIN) group have published a paper with King’s College London that offers new techniques to monitor COPD patients by non-invasive methods. COPD – chronic obstructive pulmonary disease – is a progressive lung condition with no cure in which the patient’s airways become narrowed. Together with other mechanical abnormalities, airways obstruction increases the load on the respiratory muscles. This, in combination with respiratory muscle weakness in COPD patients, increases load-capacity imbalance and contributes to breathlessness. The IBEC group’s paper elucidates a new way of assessing inspiratory muscle function using mechanomyography, a non-invasive measure of muscle vibration associated with muscle contraction, jointly with surface electromyography. 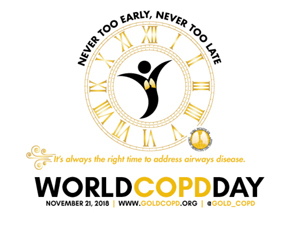 The publication coincides with World COPD Day 2018, an awareness day for this very common illness to which much of the group’s research has been devoted. 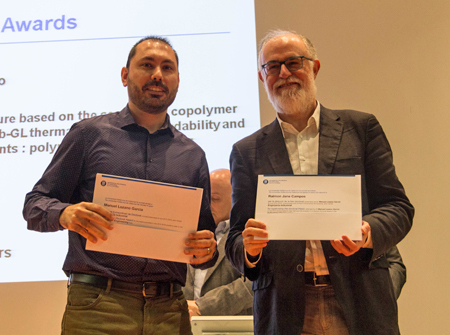 On November 9th, BIOSPIN postdoc and first author of the paper Manuel Lozano García (above left, with Raimon) received an Outstanding Doctorate Award from the UPC for his PhD thesis, “Multichannel analysis of normal and continuous adventitious respiratory sounds for the assessment of pulmonary function in respiratory diseases”. His PhD focused on the analysis of respiratory sounds applied to different respiratory diseases such as asthma and COPD, and involved a research stay at King’s College London in a framework of a joint KCL-IBEC project funded by the European Respiratory Society. In recent years, the BIOSPIN group, with the participation of Abel Torres, Leonardo Sarlabous and Luis Estrada, has also been working closely with clinicians at Hospital del Mar-IMIM and the Hospital Germans Trias i Pujol – the latter in the framework of a joint research unit – to publish COPD and asthma-related research results in PLoS ONE, IEEE Journal of Biomedical and Health Informatics, Entropy and other journals.